Design. Build. Test. Create. Innovate! Calling all innovators! Ever wanted to build a robot that could be used to explore the depths of the ocean? During this 12-week club, you’ll be able to do just that! 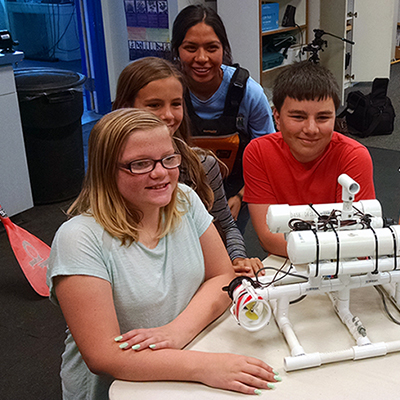 Using curiosity and determination as a guide, students in the Innovators Club will put their creativity to the test as they design and build a functioning underwater robot, or Remotely Operated Vehicle (ROV). Working together to build their ROV, students will have a chance to learn about a real life scientific tool that is used to study our ocean today. Students learn by doing as they creatively apply science, technology, engineering, and math (STEM) in order to solve real-world problems in a way that strengthens critical thinking, collaboration, entrepreneurship, and innovation all while exploring the marine environment. "As a 13 year old I wouldn't expect to walk into a classroom and be able to just build a robot"
Students are welcome to join the club at anytime throughout the 16 week semester. There is a $10 fee for each day of participation to help pay for the materials. You can register for one day, a month, or the full 16 weeks. What to bring/where: sunscreen, water bottle, extra layer, and individual snack.